Get your hands on some Cartel Coins! A mysterious design smuggled into the core worlds from unknown origins. Incredibly rare… and bristling with dark energy. 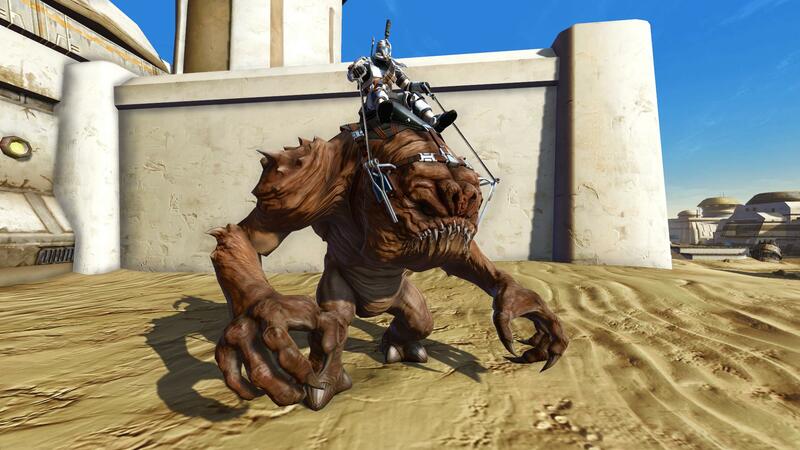 Rancor species are notoriously wild and aggressive. Rumor has it however, that Dathomir priestesses have managed to control some of the local Rancor population through powerful spells. Recover from your battle wounds with this festive Rest and Recharge item. Get yours while you can – it only appears once per year! The galaxy's spookiest landspeeder is back for three weeks only! Get yours and be the envy of the Fleet. The Voss have managed to train a select few of the local Mawvorr population – a commendable feat considering the Mawvorr's fiercely territorial nature.